On September 20 Altai State University hosted the grand opening of the III General Meeting of the Association of Asian Universities. 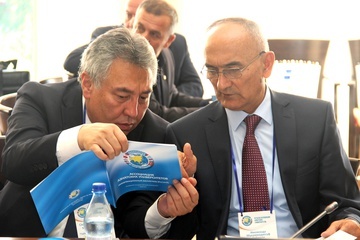 The attendees included the representatives of higher educational institutions from Armenia, Kazakhstan, China, Kyrgyzstan, Mongolia, Russia and Tajikistan. 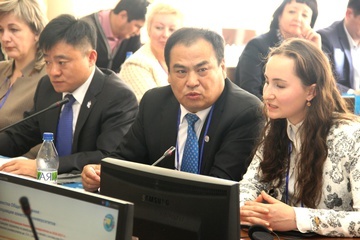 Deputy Chairman of Altai Krai Government Nadezhda A. Kapura greeted the members of the association on behalf of Altai Krai Government and Governor Viktor P. Tomenko and noted that the leadership of Altai Krai wholly supports the development of all integration processes in the field of education, science and technology. "The government of the region creates the most favorable conditions for international cooperation, cultural exchange and transfer of international practices. So, thanks to our joint work with universities in the region, the prestige of higher education institutions of the region among foreign applicants is increasing. Since 2012, the number of foreign students in the higher educational institutions of Altai Krai has increased by three times. To date, we have about three and a half thousand students, citizens of Kazakhstan, Tajikistan, Kyrgyzstan, China, India, Syria, Germany and other countries,” Nadezhda Kapura said. “Significantly enough, the event is currently taking place on the premises of Altai State University, which is a powerful scientific and educational center of Siberia and has trained more than 70,000 specialists for many sectors of the economy, education and culture of the whole country. The university managed to maintain its leading positions in the educational space of the region, raise the prestige and authority of the Altai universities at the all-Russian level. Today Altai State University, which has the status of a flagship university, faces the most important tasks aimed at the qualitative development of not only classical education, but also modern technologies, such as biotechnology, biomedicine, IT industry, and recreational capacity. Undoubtedly, the event will contribute to the creation of favorable conditions for strengthening friendship and mutual understanding and improvement of ties in higher education. Therefore, I wish all the participants of the meeting effective work and fruitful solutions for the benefit of our common cooperation." When opening the meeting, representative of the President of the Association of Asian Universities, Rector of L.N. Gumilev Eurasian National University (ENU) Erlan Sydykov Vice-Rector for International Relations and Innovations of ENU Baubek Somzhurek first of all thanked the Rector of Altai State University Sergey Zemlyukov for the idea of establishing an association and long-term work to strengthen interaction between the universities of Central Asia. Taking over from Altai State University, Eurasian National University of Kazakhstan supported the initiative of ASU in carrying out a large number of international youth events within the association that contributed to strengthening cooperation between the universities of seven countries. "In the course of 5 years the Association of Asian Universities has shown its viability and effectiveness. The association was created by representatives of 28 Russian and Asian universities, and to date the number of participating universities has grown to 70. Among them there are leading universities not only in Asia but also in the Asian part of Russia, such as Kazan Federal University and Pacific State University. 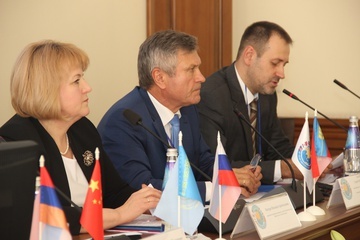 Today Tomsk State University has joined the association,” Vice-President of the AAU, Rector of ASU Sergey Zemlyukov said at the opening of the meeting. “Over the years, the association has shown that Asian universities, which are close to each other in terms of their educational potential and development history, are striving for interaction. Both lecturers and students are interested in working together. The result of this cooperation includes joint projects, educational and scientific exchange programs. For example, most Central Asian countries plan to actively introduce biotechnology into agriculture, the development of which is one of the priority projects of our flagship university. I think, this is one of the most effective areas of interaction between the universities of the association." 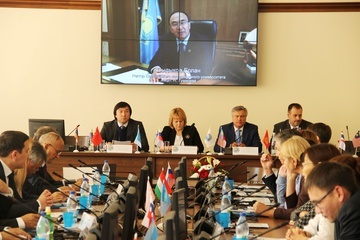 Within the framework of the meeting, a discussion of the association's development strategy for the coming years was held, and measures were taken to increase the role of AAU universities in international cooperation. One of the main issues on the agenda of the meeting was admitting and approving new members of the association, electing a new president and vice-presidents of the organization. The work of the III meeting of the Association of Asian Universities ended with a big concert with the participation of creative student groups of Altai State University and the city of Barnaul.